Hobie Forums • View topic - Another mirage drive failure - time for improvement? Another mirage drive failure - time for improvement? Post subject: Another mirage drive failure - time for improvement? Just to be clear, I am always one praise the brilliance of the mirage drive. It's an incredible machine. However, I think it's time for hobie to recognize this issue and improve on an already-great product. I understand these pedal arms are hollow to reduce weight. But it creates a very weak point where the pin goes thru. A solid aluminum pedal arm would not be much heavier, and a worthy trade-off to NOT have this happen. Murphy's law dictates failures like this happen at the worst possible times...i.e. right at the beginning of a fishing weekend, or when you're at the furthest point from the launch and you have to paddle back against the wind and current. Not to mention a ruined fishing day. It's almost gotten to the point where I'm thinking of bringing a spare drive out on the water with me. Not even kidding. You HAVE to be able to rely on these machines, and you just can't. And these boats I have (outback and PA) are NOT made for paddling. 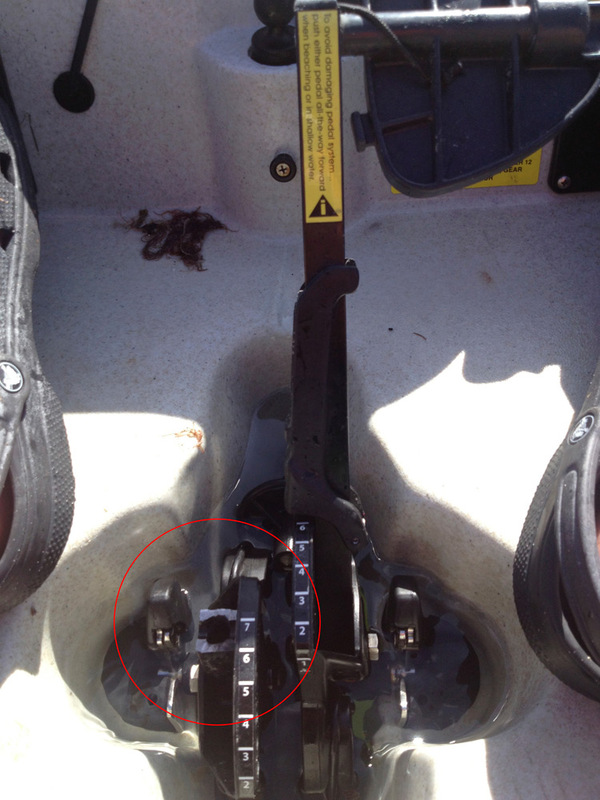 So for me, that's 2 broken pedal arms (and I've seen it happen to somebody I was fishing with), and 3 broken masts. And only one of those times was I lucky enough for it to happen near the launch. I really would like to see stronger masts and pedal arms. Even at the cost of a heavier drive. The mirage drive is a truly revolutionary invention, and I only want to see it get better. Post subject: Re: Another mirage drive failure - time for improvement? I should also mention, I stopped by Economy Tackle in Sarasota, FL (a hobie dealer and where I purchased the PA12 a year ago), and they provided a new pedal on the spot. That is EXCELLENT service, and consistent with every experience I've had with them. Best hobie dealer ever! It probably comes down to just how prevalent such breakage is. Just curious, did both of your pedal arms break on the same side? I won't ever discount a breakage or problem that somebody has. But since this doesn't appear to be common, nor acknowleged by Hobie as a problem, I have to wonder if there is something unique to this individual's use of the drive in some way. Not to disparage the user in any way, but I wonder if there is some reason that a larger, longer legged person might experience this type failure where shorter (average?) operators don't. Maybe the drives do need to be beefed up or maybe there is some sort of operation that needs to be defined for those over a certain height, weight, etc. I'm 6'7". The other guy I witnessed this happening to is 6'7" as well. Height may have something to do with it, but I doubt it. These pedals need to be bulletproof. They are breaking when they are cranked hard. And when you're cranking hard you need to get somewhere fast. For example, trying to punch thru surf, or trying to get back to the launch when T-storm clouds appear out of nowhere. They are failing at just the point I need them most, and therefore making a potentially dangerous situation even more dangerous. And these are situations kayak fishers often find themselves in. I certainly won't accept that I am mis-using them. Hey I wonder if it would be a good idea as preventative maint to pour epoxy into the hollow center of the shaft. I have not looked closely, maybe drop a steel rod in there as well. If it's metal fatigue something like that might help. Be aware that they are left and right thread (you supply the pedals) and use standard bicycle pedals. Obviously heavier, but you won't break them! They were used on the early Drives and Hobie still has a few. They should work with the current pedal adjustment assemblies and fit the drums fine -- same dimensions. I always carry a spare drive when I kayak, but I've never had to use it fortunately. My 2005 drive has the solid arms and is noticeably heavier and more robust. But I've never had any problem (thus far) out of the later model drives. I always wondered why they made the switch and figured it was a cost/weight thing. I think I saw it here last year or two, as well as discussed in our local paddling club, of a guy that raced a Revo13 in S. Miss coast competition. WOT the whole race, fast as he could go for 5-6? miles. Others I knew that saw it said it was impressive, he was really thrashing hard the whole time. Still didn't beat the faster paddlers tho. Kinda wondered why didn't break a drive. I have had three pedal breakages and numerous (turbo) fin mast breakages in several (6,7?) years of Hobie kayaking. It is invariably the case that these breakages occur when you least want/expect/can cope with them and there's no doubt that in my experience they occur most frequently when you are pushing the drive hard... Exactly what happened with my most recent breakage which was a pedal at exactly the same point as the picture above. My experience has led me to the conclusion that if you push the drive hard you are likely to experience more breakages and these are likely to occur while the drive is being pushed hard. It is pretty obvious that the failure points in the pedals and finmasts are at the point where the component is weakest or the stresses are greatest - all my broken pedals have failed around a pin-hole (2 went at the top adjustment pin hole & one went at the bottom screw hole) and in my experience finmasts invariably fail at the point where the mast exits the sprocket assembly. a) moderate my pedalling: I no longer push my drives as hard as I used to - e.g. I do not any longer use my kayaks as a way of getting aerobic exercise by "putting my head down and going for it" (that treatment is meted out on my push bike) but take a more relaxed approach and try to enjoy the trip. Also I no longer try to accelerate hard to catch waves or get through surf. Funnily-enough this has resulted in little if any reduction in my average speeds. b) make my drives more easily maintained in the event of a breakage. The top half of my drives (above the centre pin) is the latest incarnation with the easy-to-adjust cables but the bottom half, below the pin, has the old stainless steel cotter-pin sprockets. I have done this because replacing a broken cotter pin finmast is orders of magnitude easier than replacing a screw-in finmast & sprocket assembly... Especially at sea. c) always carry a comprehensive set of spares and a toolkit on board - spare fin-mast, spare cables, spare cotter pins, spare nyloc nuts, and on longer trips, a spare pedal. The toolkit includes adjustable spanner, non-adjustable spanner, pliers (for cotter pins), allen keys (2 sizes) for drive and pedal replacement. I have to say that this strategy has reduced the number of drive breakages ( especially finmasts) considerably and has vastly improved my peace of mind when out at sea. Breakages do occur and, while they are frustrating, they are usually pretty easily dealt with in minutes and are no longer anything like as critical to my enjoyment or safety as they used to be. Hi The Ta Man and al the others of course. Forgive my English i am Dutch and not so good in writing English. I read your post with interest because i have 2 guys who have the same thing with the Mirage drive pedals as you. They brake the pedal left or right. One of the 2 guys (Jan) do it for at least 2 till 3 times a year! Our Dutch kayak fishing season is only 5 or 6 months a year. Why do all the others users not have the same problem on a regular base? The first few times i listened to his story and the pedal always brakes when he crank it hard to make speed or fight against the current. Buth this is not the reason why they brake is my conclusion. Why not? On only the resistant of the fin against the water it is impossible to brake the shaft of the pedal. It can happen but only when there is a construction failure. Buth Jan has done it more then 10 times in the last 3 or 4 years. The damage to the shaft is made before and the pedal will snap later if you use it on normal way. Just like Jan told me just when he use them. I found out that if he was not peddaling, he always kept his both feeth in the straps of the pedals. So when he was fighting a fish, taking something from the back of the kayak or just sitting and drifting. The feeth and legs where al the time resting on the pedals. The other thing he did when he was not pedaling he was keeping his both feeth next to eighother. When you have your pedals at the same height you can give much more power to the pedals. You can push with you complete weight against it and this power is only on the pedal shafts. If you drill a fish and do this or just turn around and take something from behind while pushing against it you will not only give a loth of power also the power will move in different directions while you do it. So noth the only forward and back line where the drive is build for. The angle of attack changes if you are moving. I think this is when he makes small brakes in the material of the shaft and later when he pushes them in a normal pedal movement they brake. I need to say that he also uses a Hobie Outback kayak. This hull shape you can give more power with the mirage drive as the kayak hull speed can handle. I am noth saying that you do the same buth this is what i think he is doing and also the other guy. Buth they where both not aware of doing it. I tried it for myself on my Outback. Puth the pedals next to eighother and then you can give more power as the drive can handle. 2X. that makes to most sense so far in all the other post I have read. Maybe not stroke distance by the user, but what they do when not stroking. A lot of stress can be placed on both peddles at the stop position with both feet at the together position. Then small fractors in shaft. Now full out stroking and you have a failure. that's a great post. your english is one hell of a lot better than my dutch.